Anything can be cruel if misused. I imagine at some point in the future, people will make petitions saying it is abuse for people to ride horses period. I'm all for stopping abuse, but some people are getting carried away in my opinion. That petition's worth the processed hay products that I shovel up every day and dump into a wheelbarrow. While some bits are -- in my opinion -- over the top and not necessarily useful in the hands of the inexperienced or heavy handed, many snaffle bits are very mild. A nice French link three piece bit sits very easily in the mouth. And is far softer than some bit less options. There's a reason why some mechanical hackamores are called "the cruncher"
Or as Louise pointed out ... nobody can ride horses at all because "oh noes! Horses shouldn't have to carry people as it's unnatural." Everything you said here I agree with and was my exact same thought process. First bits, next saddles and eventually riding we'll see a petition for all of it. And about "the cruncher", exactly! Even a bitless bridle can be abused in the hands of someone who is either inexperienced or just plain determined to be cruel. Just as PETA wants nobody to own ANY animal. Now we have idiots who want to ride the horses without control cause bits are mean. Oh no, collars are painful to dogs and cats, so we must start taking collars off. Cool fact: horses actually originated in North America, but then disappeared here. And I used to ride a horse that would very happily "grab" his bit and help me put the bridle on. I don't think he found the bit cruel. I think he enjoyed his work and associated the bit with doing something interesting. Interesting article, but I'm not jumping on the petition band wagon at this time, even though we are using a Dr. Cook's bitless bridle with our OTTB, Sugarfoot. I'm not a fan of severe bits or rough handling of any bit, but it was suggested by our vet that we not use a bit on our boy because of facial damage that he has either from a birth defect, as we were told by the rescue, or from trauma/injury, as the vet thinks. I did a lot of research on hackamores, and bitless bridles, and the Dr. Cook's was the one that seemed the best designed to me. Bear in mind that I am completely an amateur at all of this and it has been over fifty years since I had a horse when we adopted Sugarfoot. All of that being said, we have been happy with the bitless bridle but due to foot issues, we really haven't been able to ride him as much as we would like to in these eight months we have had him. With online petition sites cropping up all around anyone can create a petition for just about any cause and the animal rights zealots are out there and like many of you said, they don't want us to even own any animals much less ride our horses. I will keep on riding my horse with my bitless bridle - lol! I love my Dr.Cooks bit less bridle and did a lot of research before choosing that particular hackamore. Any piece of equipment can be cruel if in the wrong hands including bit less bridles. I think this is just one side of the story made to be sensationalized for people that may not know any better - just like the PETA stories. 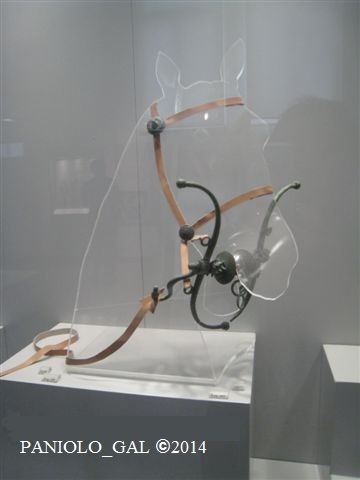 Well, even the Dr Cook's bridle has its detractors. I had one for my Thoroughbred who liked it well enough (he's on the website in the gallery) but my mare, Jet, absolutely hated it. Didn't like the poll pressure and the cross under straps. She goes very well in a simple sidepull though. My horse is the same way! He makes me smile every time I put his bridle on because he is so eager to get the bit in his mouth. And when I take the bridle off he waits several seconds before he releases the bit, as if he doesn't want to let it go. I know he really likes having something to do everyday and hates just sitting around. This petition cites that it doesnt matter who rides the hrse including experienced "soft Hands" riders bits are still inhumane. Personally I agree that it is nonsense. Below: A bit of the Greek type from the middle 5th to 4th Century B.C. The two sharp disc-like pieces were "inside" the horse's mouth! Below: A bit probably of Persian Origin. A type found from the 7th to 4th Century B.C. 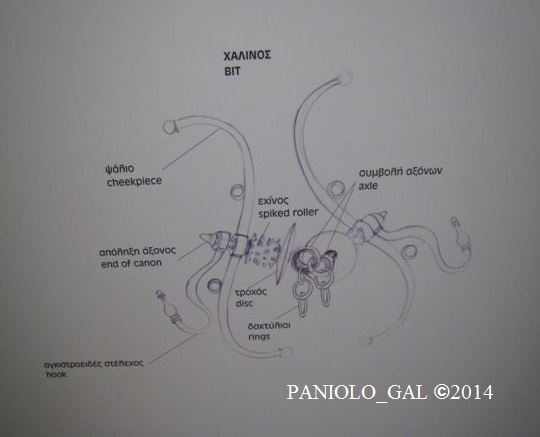 Torture is right, Paniolo_Gal. Wow. Those are interesting, but gosh, I'll just bet those were so uncomfortable - no wonder all the old drawings/paintings/sculptures show horses with gaping mouths. Ouch! I winced looking at those pictures, especially the first one with the two discs. Yikes! I was thinking the same as Celeste_in_TX as to why we always see in the ancient sculptures, friezes or paintings with the horse's mouth wide open! Ouch! Now if these types of bits were used today...they should be good reason to be banned! 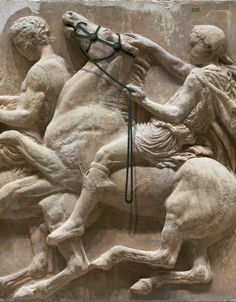 I'll try to post some images of the Elgin Frieze Horses from the Parthenon with their gaping mouths. Here are ancient sculptures where they applied a replica of the bridle & reins as it would have looked like in it's original presentation back in ancient times. 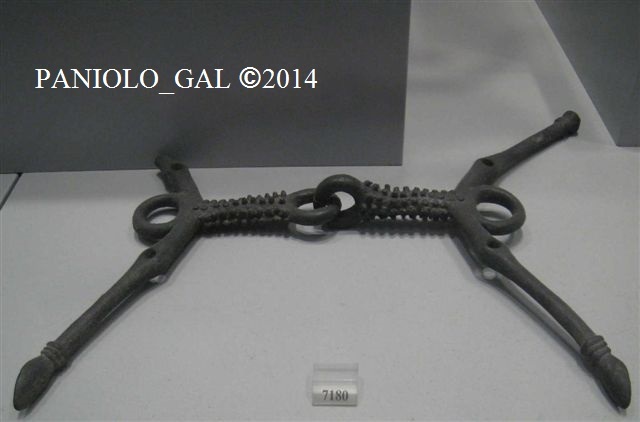 The original bridle & rein treatment has long ago deteriorated as it was not made of stone/marble. Elgin Frieze at the British Museum. marble friezes back to their lands. 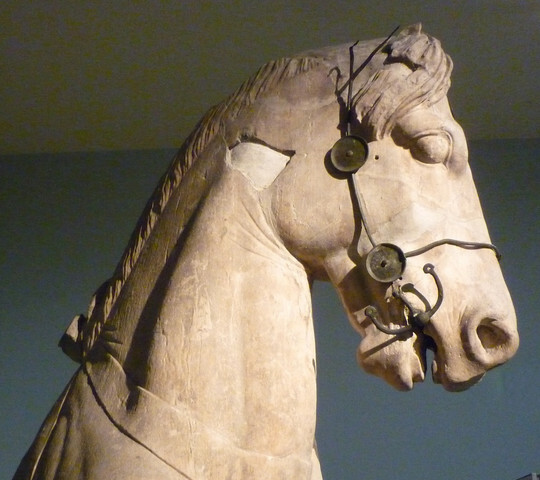 "Here are ancient sculptures where they applied the simulated bridle & reins onto the horse to show us what the exterior appearance looked like with these torturous bits as the original bridle & rein treatment has long ago deteriorated." Since these are ancient history and although quite interesting, they are not part of today's equipment. These will fuel some special interests who can take the information out of context and make it appear current. What I think would be an interesting change in racing equipment would be to make all horses race in the same equipment-like a snaffle bit. That would be a major change. A bit should be about communication not control. Never thought of it that way Keta...that it would be taken out of context and altered in meaning. So I've reworded the phrase above the Elgin Frieze images so there is minimal mis-interpretation...I hope. "Out of context" has been part of the media game in so many different areas.